the recording group for moths in Essex. As a result of the national appeal for the formation of county moth recording groups, the Essex Moth Group was formed on January 20th 1996, at the Mistley home of Ian Rose, when 14 Essex moth recorders and enthusiasts set up the group, with Joe Firmin as Chairman. We are sad to announce that Joe Firmin passed away at home on Monday 18/03/13. Joe was already Chairman of the Essex Lepidoptera Panel which checks and monitors records, initially for the production of The Butterflies and Larger Moths of Essex (Essex Naturalists Trust, 1975). Currently the Essex Moth Group has more than 70 members using moth lamps and garden traps, as well as conducting field recording sessions throughout Essex. The Group welcomes new members and anyone interested in helping or seeking information can contact the Essex Moth Group forum and the Essex Moth Group Facebook page. The Group arranges a popular annual meeting and exhibition, and the 2018 event was held on Sat 10th February 2018 10.30am – 5pm at the Green Centre at Wat Tyler Country Park, Pitsea Hall Lane, Pitsea, Basildon, Essex SS16 4UH directions. There was a full day's programme of illustrated talks, exhibits, discussions, lunch and refreshments. 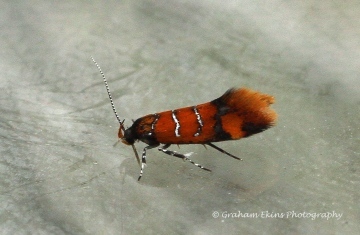 You can download a pdf of the 2019 Essex Moth Group Newsletter put together by Dougal Urquhart. Butterfly Conservation have provided information on the micro-moth maps on the Moths Count website which have been updated with ‘old’ new VC records and 2013 records. An Environment Agency fact sheet on sea wall mowing regimes is available here.